The quality of our work is of the highest standards and our boats have been consistent winners at classic boat shows throughout the Midwest and East Coast. When you ship your boat to us, you can have peace of mind knowing that all phases of the restoration will be performed in our shop only. We do both major and minor engine work here on site. We also do canvas work and install complete new interiors in your choice of leather or vinyl. We specialize in all forms of hull reconstruction, be it plank replacement or the entire substructure. We plane up all our own hardwoods and keep in stock a generous supply of mahogany and white oak. The Wooden Boat Shop is the “West Bottom Headquarters” of the Midwest. We do more West Bottoms than any other shop in the country. Should you ever be in the area, please do not hesitate to drop in and see what we are all about. We have eight full time employees here to serve you and all of us are happy to demonstrate what we do best! Everyone likes to see how West Bottoms are done – so, please stop in. Every restoration product that we use in our shop is available for sale here in our ship’s store. We carry Z-Spar, Interlux, Epifanes, Pettit, 3M, WEST System, Nautolex and Woolsey products, just to name a few. We have engine parts for Chris Crafts, Greymarine, Crusader, Chrysler and water pumps and water pump impellers in stock. We also have Lovett automatic bilge pumps in 6 and 12 volt. Remember, technical advice is always free of charge when you purchase products from The Wooden Boat Shop. We also overhaul carburetors, generators, starters, distributors and water pumps through our mail order. Just send it in and we can provide two day service on these items. We also have a cylinder head exchange – just send your heads in and we will send you a fresh set back. That’s the fastest valve job ever! We also carry a complete line of marine gaskets for all engine models no matter how old they are. We have transmissions, motor mounts and carburetor kits for all models, and again no matter how old. Got a bad exhaust or intake manifold? Let us help! We pick up and deliver boats for restoration work anywhere in North America either on one of our road trailers or on your trailer. We are always happy to haul your boat. Just give us a call. In summation, please contact us for all your boat’s needs. 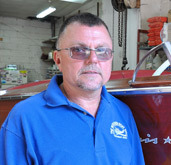 If you are restoring your own boat and have a question, do not hesitate to call! If you would like us to prepare an estimate to restore your boat, please call 513-941-7281. I look forward to hearing from you soon!